The stay-at-home strategy continued to perform well in 2Q16. The major forces that drove markets in 2015 have reversed in the first half of this year. Crude oil prices have rebounded and the monetary policy divergences between the US Fed and the Bank of Canada have narrowed. The price of WTI crude oil, which began the year at US$37 per barrel and touched a 12-year low of just over US$26/bbl in February, then rallied back to finish 2Q16 at US$48/bbl. On the monetary policy front, the Fed, which had contemplated as many as four policy rate hikes in 2016, is now not expected to raise rates even once. The BoC, after anticipating the Liberal government's promised fiscal stimulus, went on hold in January and remains firmly on hold. The BoC decision to stand pat, combined with the Fed backing off on tightening, sparked a 12% rally in the Canadian dollar from the January low of 68.6 US cents to 76.8 cents by the end of March. After rallying further to test the 80 cents level in early May, the Canadian dollar fell back at the end June to 77.4 cents, amid risk aversion related to Brexit and signs that Canada's real GDP growth had stalled in 2Q. The rise in crude oil prices combined with the 0.7% gain in the Canadian dollar in 2Q16 provided tailwinds for stay-at-home portfolios while unhedged global ETF portfolios were able to recoup some of their losses sustained in the first quarter. A stay-at-home 60/40 investor who invested 60% of their funds in the Canadian equity ETF (XIU), 30% in the Canadian bond ETF (XBB), and 10% in the Canadian real return bond ETF (XRB) had a total return (including reinvested dividend and interest payments) of 3.7% in Canadian dollars. All of the unhedged Global ETF portfolios that I track in this blog posted gains for 2Q16. Since we began monitoring at the beginning of 2012, however, the unhedged Global ETF portfolios have vastly outperformed the stay-at-home portfolio. 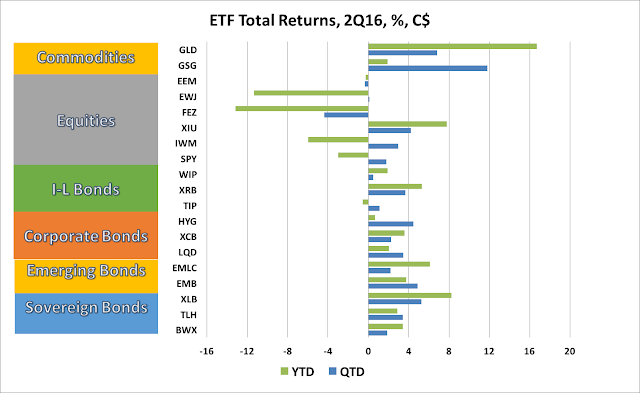 In 2Q16, with the USD depreciating 0.7% against the CAD, global ETF returns favored commodities and bonds. In CAD terms, 17 of the 19 ETFs we track posted positive returns, while 2 ETFs posted losses for the quarter. 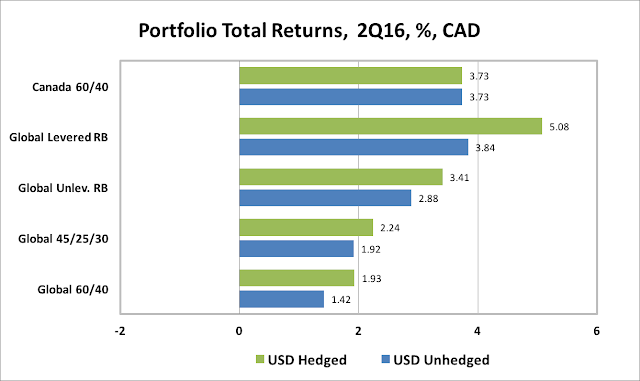 The chart below shows 2Q16 returns in CAD terms, including reinvested dividends, for the ETFs tracked in this blog. The best gainer in 2Q16 was the commodity ETF (GSG) which returned 11.8% in CAD terms. The Gold ETF (GLD) returned 6.8%, while the Canadian long bond ETF (XLB) returned 5.3% in CAD terms. Other ETFs with strong returns for the quarter included Emerging Market Bonds (EMB) 4.9%; US High Yield Bonds (HYG) 4.5%; and Canadian equities (XIU) 4.2%. The worst performers, were the Eurozone equity ETF (EWJ) and the Eurozone equity ETF (FEZ), which returned -4.4% and -0.3%, respectively in CAD terms. For 2016 year-to-date, the best performing ETFs in CAD terms were gold, the Canadian long bond and the Canadian equity ETF. The worst year-to-date performers were Eurozone, Japan (EWJ), US small cap (IWM), and US large cap equities (SPY). 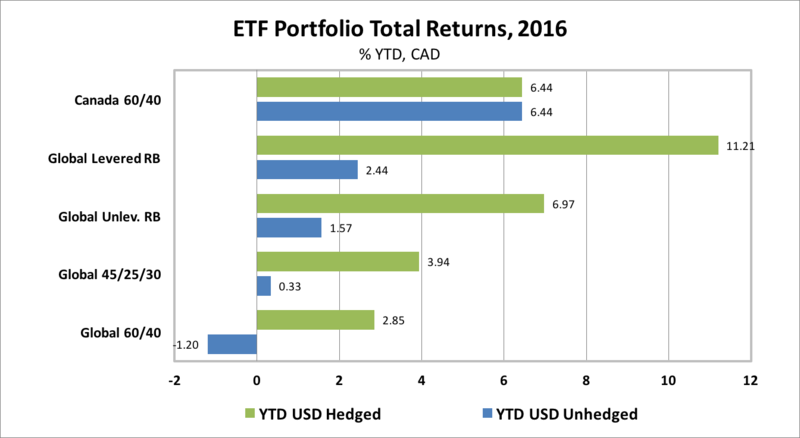 In 2Q16, the Global ETF portfolios tracked in this blog all posted positive returns in CAD terms. This was true whether USD currency exposure was hedged or left unhedged, but the USD hedged portfolios performed better for a second consecutive quarter. A stay-at-home, Canada-only 60% equity/40% Bond Portfolio returned 3.7% in 2Q16. 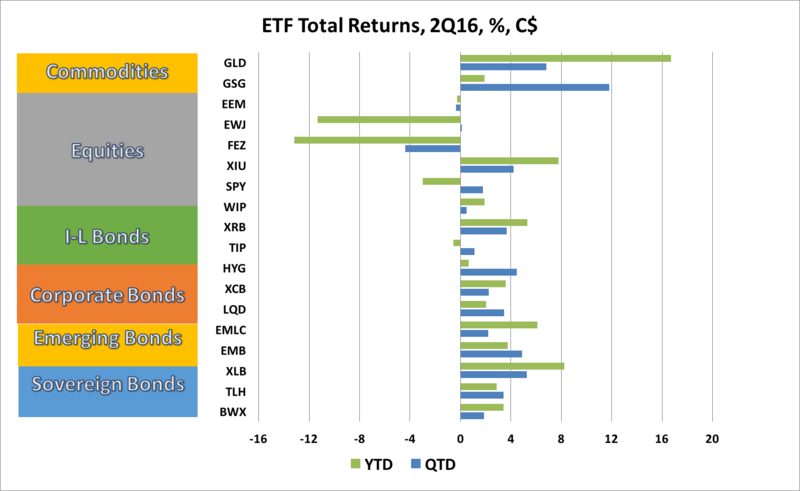 Among the global ETF portfolios that we track, risk balanced portfolios outperformed in 2Q16. A Global Levered Risk Balanced (RB) Portfolio, which uses leverage to balance the expected risk contribution from the Global Market ETFs, benefitting from strong levered bond returns, gained 3.8% in CAD terms if USD-unhedged and had an even better gain of +5.1% if USD-hedged. An Unlevered Global Risk Balanced (RB) Portfolio, which has less exposure to government bonds, inflation-linked bonds and commodities but more exposure to corporate credit, gained 2.9% if USD-unhedged and 3.4% if USD-hedged. The Global 60% Equity/40% Bond ETF Portfolio (which includes both Canadian and global equity and bond ETFs) returned 1.4% in CAD terms when USD exposure was left unhedged, and 1.9% if the USD exposure was hedged. A less volatile portfolio for cautious investors, the Global 45/25/30, comprised of 45% global equities, 25% government and corporate bonds and 30% cash, gained 1.9% if unhedged and 2.2% if USD hedged. On a year-to-date basis, the all Canadian stay-at-home ETF portfolio has been a solid performer, returning 6.4% ytd, outgunning all of the unhedged global ETF portfolios that we monitor in CAD terms. If USD exposures were hedged, however, the best performing portfolio was the Global Levered Risk Balanced Portfolio, which returned 11.2% in CAD terms. The key market events of the first half of 2016 that influenced global ETF portfolio returns in CAD terms were: the market's rising conviction that the Fed is unlikely to raise rates in 2016; the BoC's decision to eschew further easing; and the improving balance between global supply and demand for crude oil. These events occurred against a backdrop of further downward revisions to global growth expectations and significant geopolitical uncertainty. After rising at a 2.4% annualized pace in 1Q, Canada's growth likely stalled in 2Q, in part due to the disruption caused by the Fort McMurray wildfires. Early indications for US growth, based on the Atlanta Fed's GDP Now forecast, point to 2.4% growth for US real GDP in 2Q, after just 1.1% in 1Q. On balance, 2016 growth expectations have been revised down quite sharply, for Canada to 1.5% in June from 1.9% in December and for the US to 1.7% from 2.4%. Outside Canada and the US, growth prospects have also cooled. The UK real GDP forecast for 2016 has been cut to 1.5% in the wake of Brexit from 2.4% six months ago. Eurozone growth expectations have been marked down to 1.6% from 1.8%. Japan's growth now expected to reach only 0.7%, down from 1.1%. The sharpest cuts in expectations are for emerging market economies, with 2016 growth expectations down to 3.8% from 5.2%. Meanwhile, Fed Chair Janet Yellen's message has been clear that the Fed will proceed cautiously with tightening, especially in light of the uncertainty trigged by the Brexit vote in the UK. In Canada, with substantial increases in government spending announced in the federal budget providing second half stimulus, the Bank of Canada is signalling that it will remain on hold for some time. At the end of March, we said "A sharp decline in worldwide oil and gas exploration and development spending suggests that crude oil production growth will slow, perhaps bringing global oil demand and supply into better balance as 2016 unfolds". That process continued through 2Q16, lifting crude oil prices to test US$50/bbl just before the Brexit vote. The rise in prices has halted the sharp decline in the North American rig count, but energy investment intentions continue to ebb, especially in Canada. Now that oil prices have recovered as seasonal demand for gasoline has hit its high point, the question is whether the crude oil price gains witnessed through 1H16 can be sustained, against a backdrop of sluggish global growth. This leaves markets in a similar position to where they were at the beginning of 2016. Equity market valuations remain stretched. Government bond market valuations are even more stretched as US and Canadian 10-year bond yields have fallen to new lows, while German, Swiss and Japanese 10-year yields are all negative. The declines in global bond yields are a reflection of growth disappointments around the world and the market's assessment that this will result in more accommodative monetary policies than previously thought. Monetary ease has pushed up prices of gold and other commodities and has supported equity prices. We are living in an upside down world in which growth disappointments seem to lift financial asset prices because investors expect that weak growth will spur even more accommodative monetary policy. In a continuing uncertain environment, characterized by sluggish global growth, record high debt levels, unprecedented central bank stimulus, and a high level of geopolitical risk, remaining well diversified across asset classes, with substantial exposure to USD-denominated assets and with an ample cash position continues to be a prudent strategy.